A modular test system of individual reagents for professional users with a high frequency of tests. Liquid reagents are supplied in 30 mL and 60 mL dropper bottles which can be refilled. 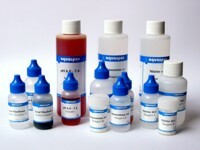 Reagents are available in pack sizes from 30 mL to 1000 mL (4.5 g to 75 g for powders). Currently 17 titrimetric and photometric methods are available within the aquaspex professional range. Reagents for the titrimetric determination of Alkalinity. Reagents for the titrimetric determination of Calcium. Reagents for the titrimetric determination of Chloride. Reagents for the titrimetric determination of Dissolved Oxygen (Winkler Method). Reagents for the titrimetric and photometric determination of Nitrite. Reagents for the titrimetric determination of Peroxide (redox titration). Reagents for the photometric determination of Ammonium. Reagents for the photometric determination of phosphate. Reagents for the photometric determination of pH. Reagents for the photometric determination of Nitrate. Reagents for the photometric determination of Copper. Reagents for the photometric determination of Iron. Reagents for the photometric determination of Chlorine. Reagents for the photometric determination of Silica. Reagents for the photometric determination of Chromate. Reagents for the photometric determination of Manganese.